Here you’ll find travel reports about Derby. 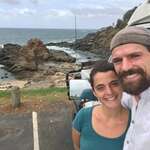 Discover travel destinations in Australia of travelers writing a travel blog on FindPenguins. Ich war noch nie so sprachlos. Der little blue lake ist einfach nur wunderschön! Tom: Can you fix my brakes? Guy: Maybe you should upgrade. But in the end the old Canyon did a great job shredding down the slopes of Blue Derby. Exploratory mountain biking at its finest. Ascending through rain forest, alongside waterfalls and speeding down via berms and ferns, small jumps and over roots and rocks. Derby went from a tin mining town to a mountain biker Mekka and has something for everybody. Jo and Vivi also had great fun joining me on the beginner trails and did an amazing job for first time single trail riders. The scariest bit was actually when that poor fellow of a snake snapped at me on the trail cause I saw it too late. It buggered off after, so I’m hoping I didn’t hurt it after all. great facilities and purely fun mountain biking! We decided to move on from Petal Point as the village green camping area was filling up, there were a few couples sleeping in swags, a couple of tents, 3 old caravans and 4 boats (1 was quite large) along with kids and dogs, so the atmosphere had changed, the serenity of a camp we had all to ourselves looking out over the ocean had gone, but we had that experience for the previous 3 days which was great so we are moving before the memories are spoiled.